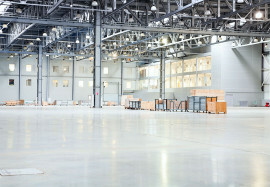 Believe it or not, having cracked and dirty concrete floors can affect the productivity of your company. It can also create safety issues with your employees. Thanks to recent advances in concrete polishing equipment and technologies, the experienced concrete experts of StoneCare of Texas can repair most damage and cracks. Our dustless grinding systems can hone and polish your concrete surface to a functional and beautiful shine without toxic chemicals. We can also apply a concrete densifier that fills pores to increase wear resistance and surface strength. Polished concrete floors never need waxing, coatings or painting. Ever. Polished concrete is easy to clean and resists spills and stains. That means less need for janitorial services or toxic cleaning supplies. Polished concrete is very durable. Less damage means lower restoration costs. The reflective nature of polished concrete reduces the need for more lighting. The thermal mass polished concrete holds reduces heating and cooling bills. Polished concrete floors are 100% fire resistant. Polishing an existing concrete floor is cheaper and creates a smaller environmental impact than the demolition and reconstruction of a new floor. In addition to being being easier to clean and more durable, your newly polished concrete floor will meet the NFSI (National Floor Safety Institute) standards for certification as a “high traction” floor — retaining its safe non-slip qualities under both dry and wet conditions. Polished concrete floors also comply with both ADA and OSHA recommendations for interior floor surfaces. Need professional concrete polishing services? Boost your company's productivity, safety and morale. Your concrete floors can look better, stronger and safer than ever before. Contact us online or call us: SAN ANTONIO (210) 656-8019 or AUSTIN (512) 250-2613. Awesome work, floor looks new again! Guys were great, very knowledgeable...Thank you!